Satanists, such as Thelemites, revered their spiritual home – Boleskine House, the demonic stronghold of the wickedest man of the 20th Century, Aleister Crowley. Crowley cast a spell for 6 months, demonically infesting his Boleskine House, over 100 years ago. In less than a minute, I had spoken the words which would decimate Boleskine House with fire and send the spiritual realm reeling. And, I hadn’t a clue what I had done. The below is not to boast, but to show practical examples of the weapons available to Christians. If all the writings in the Bible of offensive weapons, defense, health, guidance, abundance, etc. are mere marks on the paper, and cannot be used in real life, then the Bible is of no value. The below is not a comprehensive list of my victories through Christ, for God’s glory, but are the more notable ones. Importantly, I am just a regular person. If God accepts your repentance, you are baptized, you pray and fast, find your place, and you WAIT for the Lord to give you good works to do (not doing ‘good’ works on your own) – you can do likewise. 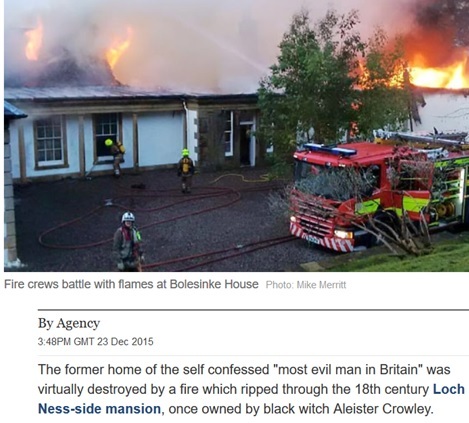 Aleister Crowley – the Satanist, Occult Magician and founder of the Thelema religion, left behind ‘Boleskine House’, a house made demonic after a 6 month (interrupted) magickal spell. Thelemites and various occultists face towards Boleskine house in their rituals. 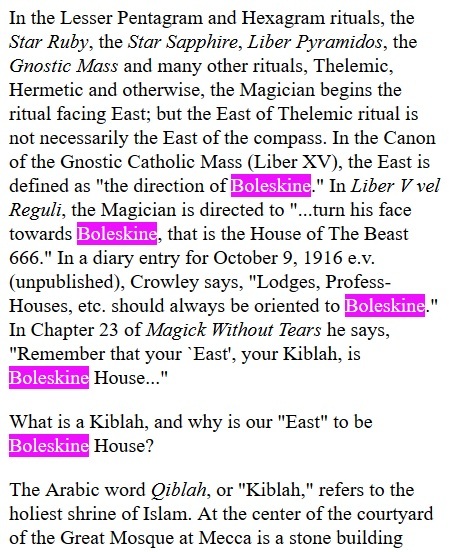 I had learned about Aleister Crowley for a while, and, being a Led Zeppelin fan, knew about Jimmy Page’s previous ownership of Boleskine House. But, in less than a minute, I had spoken the words that would leave Boleskine House in flames. Although the lines of scripture that I prayed while fasting were fairly set, I unusually decided to add two seemly unrelated parts of scripture during a mid-December 2015 fast. In retrospect, I had no discernable reason to do so. In less than a week, Boleskine House was in flames. I read in the news that Boleskine House burned, and I thought: didn’t I pray and fast for fire from heaven a bit before then? But so many places burn every day. I dismissed this seemingly silly notion. However, about two months later, I examined my list of scripture for prayer, and I saw the two parts of scripture that I had added. I remembered the fire in 1 Kings 18:36-38. But I had forgotten about breaking the leviathan in Psalm 74:12-14. The only modern day leviathan that I know of is the Loch Ness Monster (real? not real?). And then, I looked at the map of where Boleskine House stood. I never realized Boleskine House was right on Loch Ness. Regarding the election, I prayed that whichever candidate won, that it would be for the glory of the Father through the Son and Son through the Holy Ghost. Christians are to pray first for those in authority, even before praying for the impoverished and the desperate. None of the candidates were perfect, as none of us are, but I felt moved to counter Hillary Clinton, and effectively back Donald Trump. In fact, I felt the need to launch arrows. Put yourselves in array against Babylon (Hillary) round about: all ye that bend the bow, shoot at her (Hillary), spare no arrows: for she hath sinned against the LORD. And, at this time, in my youtube feed, there were a lot of ’Halloween’ videos exposing the demonic and satanic people for who they were. I thought it would be great if people would see these demonic forces revealed and exposed. In fact, for quite a few weeks prior to this, when I was near the demonic (such as the local Freemason temple or near the local Virgin Mary statue), I demanded that demons show themselves for who they are. I repeatedly demanded, as Christ said: What is thy name? Not only was Hillary Clinton defeated, but the demonic has been exposed with #PizzaGate and #SpiritCooking. 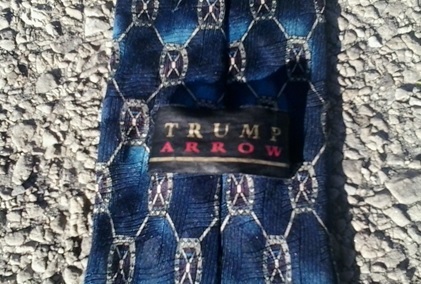 I knew that I had, in my closet, a tie that said "Trump", but on the day after election day, I found that it also said "Arrow." The tie has red, purple, but mostly blue. 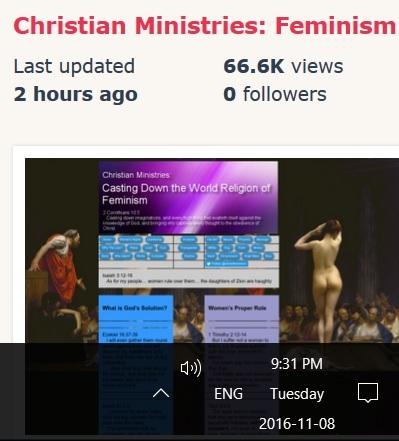 Ominous: An interesting view count as the election results are finalising on Nov 8th. Even though, for many months, I had worked at a place that was right on the beach of a large body of water, I had never bothered to walk to the beach to take a good look. One day in June 2014, I walked to the beach (twice), and I marvelled how those waters were divided from the land, and how that boundary had stood. On the way home, I listened to a Derek Prince sermon. He spoke on how he had prayed and fasted to change history, and he gave a line of scripture that he said might be useful for the listener. Although Derek Prince applied these boundaries to communism – at the time, I had been researching the Bitcoin and digital currencies and their relationship to the Mark of the Beast. I interpreted that my use of Job 38:11 was to hold back the rise and acceptance of the Bitcoin. For almost two years after that day, I prayed and fasted and spoke Job 38:11 with God’s authority, and watched the Bitcoin be knocked down. In short, digital currencies such as the Bitcoin are precursors to the Mark of the Beast. They have risen in value and usage and will continue to do so, but this will be on God’s timeline, not on the Devil’s. At the time, I was listening to sermons on the importance of praying for leaders. We must pray for them first, even before praying for the sick, the destitute, and the poor. During my usual fast in the run-up to Halloween 2015 (to confound the most important holiday of Satanists), I believed my place was also to pray and fast for leaders. I always regarded celebrities and journalists as opinion leaders, and, at that point, I believed I should pray for an up and coming journalist – a British columnist named Milo Yiannopoulos. Much to my surprise, Milo delivered what could be the most anti-feminist moment of his career. On the third day of this praying and fasting (Oct 26th, 2015), Milo Yiannopoulos published this article about funding the Red Pill movie. Apparently, the dire financial situation surrounding this film meant a miracle was necessary for it to see the light of day. And that's exactly what it got. Please note that this does not mean Milo Yiannopoulos is morally ‘good’ (or Cassie Jaye – the filmmaker of the Red Pill movie, or myself for that matter). The Lord uses those that He will, including the wicked. 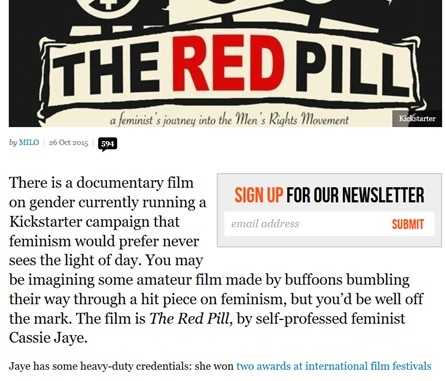 Milo’s article thrust forward a series of events which funded and produced Cassie Jaye’s Red Pill movie, which is about men’s rights and critical of feminism. I had read, in various articles, that India suffers perhaps the worst feminism in the English speaking world. So, I became moved to pray for India during my fast. I cast down the feminist demons: Lilith, Freya, Jezebel and Oprah (yes). I tormented them and commanded them to the deep – as I can do even greater works. What have I to do with thee, Jesus, thou Son of God most high? I beseech thee, torment me not. ...And he said, Legion: because many devils were entered into him. You said it Lord, please do it. And Mary said, Behold the handmaid (handservant) of the Lord; be it unto me according to thy word. On the first day of the fast, November 29th, 2014 it seemed that things were not going well. 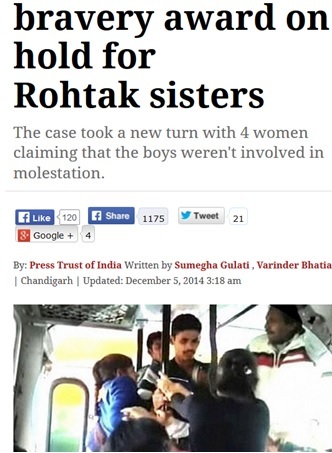 That weekend, the Rohtak Sisters were the new feminist heroes, as the media reported how they fought evil men on the transit system in India. However, it later emerged that these women had been attacking men for money and sport. I started a fast on Saturday July 25th, 2015. I had a fairly standard set of scriptural lines that I prayed, including Psalm 18 – possibly my favorite Psalm. On Sunday evening, July 26th, I was about to go to bed. As I mentally checked off my list, I realized that I had not prayed Psalm 18. I would do it tomorrow. But for some reason, I felt moved that I should change my mind. So I walked all the way down the corridor to the far room and opened my Bible. 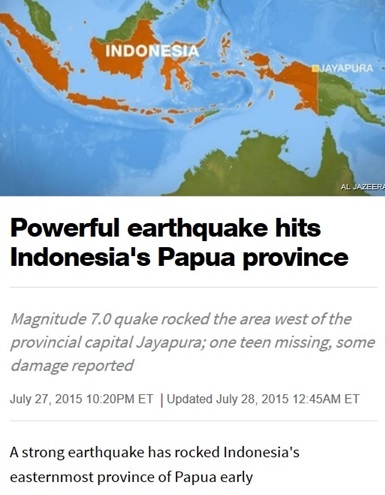 Within hours, Papau in Indonesia experienced an earthquake (July 27th, 2015). 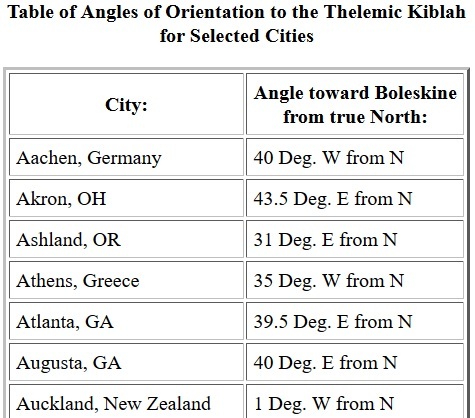 I’m not sure why this area of the world was targeted (false gods perhaps?). During mid-August 2016, I believe that God was giving me a bit of leeway. That is, at this point, I was looking to God for guidance, and God seemed to convey – you’ve learned a certain amount of your Bible at this point – what does your judgement say? I looked around and saw all the images of Buddha that had sprung up at the local stores (garden ornaments and supermarket products), and I put Buddha in my crosshairs. And, I prayed lines of ‘shaking the earth’ – those below and a few other similar lines of scripture. – I realized on August 23rd that, without a doubt, the Vatican's Virgin Mary was the whore of Bablyon. 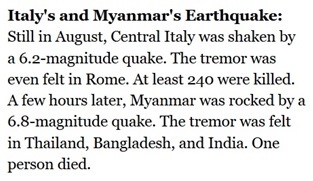 On August 24th, an earthquake struck Mynamar (Burma), a Buddhist country, decimating many Buddhist temples and shrines. 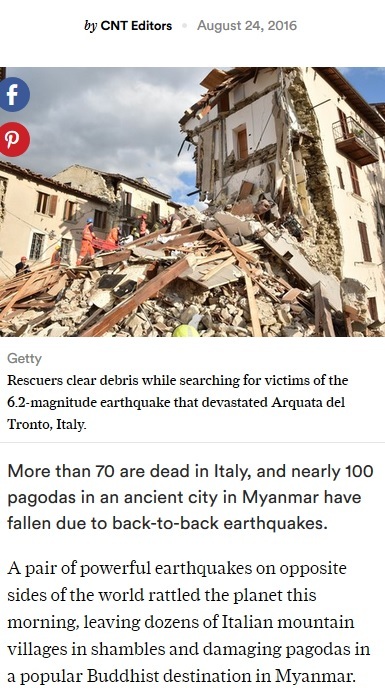 And, as an extra, an earthquake hit Italy on the same day – which I consider to be a warning shot to the Vatican.